When Melbourne decided to create a new building to complement their existing offices, they decided to set an example to the rest of the Australia. Completed in 2006, Melbourne’s Council House 2 building, or CH2, as it is known, is the first building in Australia to achieve a six star rating from the Green Building Council of Australia. The 10 storey building was designed by DesignInc in conjunction with the City of Melbourne and is located on Little Collins Street. CH2 obtained the six green star in part because of it’s many innovative and technological features including photovoltaic cells, chilled ceilings, blackwater sewage recycling systems, all within a budget of 50 million Australian dollars. But by far the most striking features of CH2 are its recycled timber louvers controlled by photovoltaic cells and the five shower towers, 1.4 meters in diameter and 13 meters long, that draw air from over 17 meters above street level, in which water droplets evaporate slightly as they use up energy and thus cool the air. Shower towers lower air temperatures to around 21°C (from around 35°C) and lower water temperatures to 12°C. Other features worthy of notice are wind-powered turbines which will help cool the building at night, internal thermal mass, a gas fired co-generation plan, as well as the recycling of the waste heat generated inside the building for their heating/cooling system. It is expected that the sustainability features of the building will have paid themselves in a period of about 10 years. All that plus the expected increases in productivity, lower maintenance costs and bragging rights for the city make CH2 one of the finest examples of Australian sustainable architecture. For considerably more information, including a detailed report on the building, visit the City of Melbourne CH2 website. what are the foundations made from? what is the structural framework made from? If the answer to the first question is portland cement based concrete, then has the ecological impact of such a product which is well documented to be highly energy inefficient not to mention just plain nasty with the additives combined with portland cement, been factored into the ecological impact of this building? If the answer to the second question is steel (I'm assuming it's a post and beam steal fabrication, is that correct?) then the energy of producing and transporting the steel would need to be factored in to the overall energy rating of the building. Incidentally, there is a product that has the tradename HL5 or something similar which is none other than lime, with some additives, but nonetheless a much more environmentally sound product than portland cement. It can be used to form a lime-crete, though for the stresses of a high rise building, I'm not sure if it would be suitable. There are other alternatives to concrete footings, which sadly is an art that is long forgotten and inevitably lost. This brings to mind a 5-storey rammed earth building I once read about, with an initial "footing-wall" 600mm thick! gradually reducing as the building gets higher to about 250mm at the top. I must research the footings used for this building! Paul: This project is a world leader and one of the best steps forward for ESD in commercial buildings, why look for problems? lets see your name next to a better project. good work Mick and DesignInc. Paul: I'm sure that you are probably right and that they have to retreat the timber every once in a while. I do believe that they designed them to be easily dissassembled, so at the very least the maintenace cost will likely be lower. As for the fire retardant chemical, looking at all the resarch work that was done for the building, I'm sure that they chose the least environmentally damaging one. Burt: The overall cost of the building was higher than that of a standard office building. However, they did a cost study which showed that the sustainability features, all 11.3 million australian dollars worth of them, would pay themselves back in about 10 years, and this is just on energy savings. Do read the whole thing as it is fairly well documented as to what measures they took when designing and constructing the building. Looks great, As usual, it relates to cost. Fixed costs, and variable costs. No mention of ground source energy? Efficiency, air filtration, etc. Will have to read the full feature about the building. B.T. Hmm, that wood exterior passed their fire code requirements? I would expect the wood would have to be treated with a fire retardant chemical, which might, over the years leach out and need to be replenished periodically. When Melbourne decided to create a new building to complement their existing offices, they decided to set an example to the rest of the Australia. 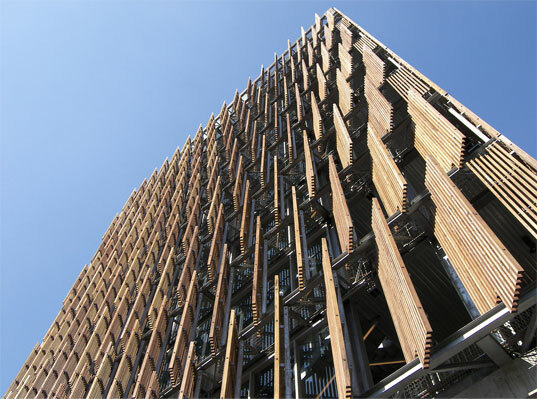 Completed in 2006, Melbourne's Council House 2 building, or CH2, as it is known, is the first building in Australia to achieve a six star rating from the Green Building Council of Australia.